B.R.A.K.E.S. fills the gap that most driver’s education leaves out: what to do in an emergency. Most mothers are nervous about letting their teen drivers out on the road, and with good reason: Every year, car crashes kill around 2,200 teens and send another 220,000 the emergency room. Car wrecks are, by far, the number-one cause of death among 16-to-19-year-olds. Every day, six families get the phone call that is every parent’s nightmare. Doug Herbert, a professional drag racer, got that call in January, 2008. His 17-year-old-son Jon was driving recklessly, crashed his car, and killed himself — along with his twelve-year-old brother, James, who was in the passenger seat. How does this happen? Driver education in this country is woefully inadequate: Our kids get a few hours of instruction and a laughably simple test before they can legally face what is literally the most dangerous threat to their young lives. The law requires them to learn the rules of the road, but not how to handle a car in an emergency. That’s up to us, but most of us learned to drive twenty or thirty years ago, and car technology has changed. We simply aren’t equipped to teach our kids how to handle a car in an emergency — or how to best avoid those emergencies in the first place. Doug Herbert wants to ensure that no parent has to go through what he did, so together with Jon and James’ friends, he set up B.R.A.K.E.S. (Be Responsible And Keep Everyone Safe—the kids came up with the name). This is a half-day course that gives the kids the hands-on experience they need to learn how to properly handle a car. And it’s free—totally, completely, 100% free. The B.R.A.K.E.S. curriculum is based on real-life accident data that shows showed exactly what kinds of crashes are most likely to kill or injure our kids. A brief classroom session covers proper seating position, basic car dynamics, and, most importantly, the types of dangers kids face. Doug and his instructors are quick to remind the assembled families that teen deaths don’t just happen behind the wheel. Doug reminds the assembled families that his son Jon died because he drove recklessly, and his son James died because he didn’t try to stop his brother or get out of the car. Kids spend most of the four-hour class is spent behind the wheel, but not in their own cars: The vehicles are supplied by Kia, one of B.R.A.K.E.S.’ major sponsors. The teens break up into groups and are led by professional instructors through several driving exercises: High-speed swerves, panic stops, recovering from a wheel off the road, and skids. For the latter, the program uses Kias with plastic skins over the rear tires that reduce traction. The cars spin easily, and kids learn to recover before the car spins out. Unlike other teen driving classes we’ve attended, the parents aren’t simply left to sit and wait: They have their own curriculum, which includes instruction on the best ways to teach teens and the importance of making sure kids get plenty of time behind the wheel. (“When you leave, we don’t want to see any parents behind the wheel,” the instructors admonish. “Your kids need the experience.”) B.R.A.K.E.S. has a dedicated fleet of Kias and a separate course in order to give parents some hands-on experience in some of the same exercises their kids are doing, including panic swerves and stops. B.R.A.K.E.S. also organizes other groups to provide additional instruction; for example, on the day we attended the class, a local trucking outfit brought out a pair of big rigs. Parents and teens could sit in the driver’s seat to experience just how limited a truck driver’s visibility is, then take a ride in an eighteen-wheeler to see how much space they need to accelerate, turn and stop. When the class concludes, parents and teens are asked to sign a pledge. Kids agree to drive safely, soberly, and without distraction, and to always call their parents if they don’t have a safe way to get home. Parents agree to spend 40 hours teaching their teens to drive, to give them a “get out of jail free” card if they need a ride home, and to abide by the same safe driving practices as their children. 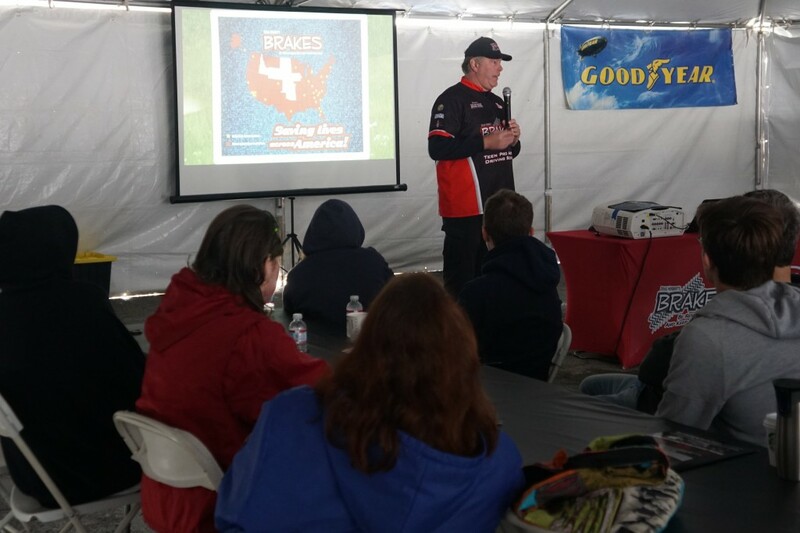 So far, over 22,000 teens have attended the B.R.A.K.E.S. course, and Doug Herbert is looking to expand the program; he and Kia are working on adding a third group of cars and instructors. Doug can’t bring back Jon and James, but he’s doing everything he can to keep other teens safe—including yours. To find out when B.R.A.K.E.S. is coming to a town near you, visit www.putonthebrakes.org. Special thanks to B.R.A.K.E.S. and their sponsors and participants (Kia, Goodyear Tires, DMV.org, Mothers Care Care Products, KKW Trucking, California Highway Patrol, and Fairplex Pomona) for allowing the author to experience the program first-hand along with his son and my niece—and for all they have done to make 22,000-plus kids safer on the road.